Roasted Veggie Smothered Baked Potato is easy to prepare and tastes great. Build your own recipe. 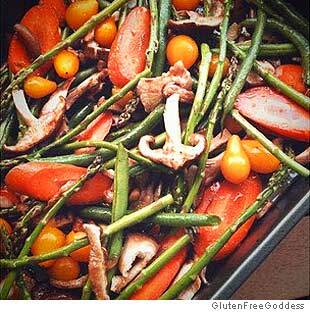 Cut up whatever fresh veggies you have on hand, throw them in a roasting pan and toss with a little olive oil and sea salt. Add a good dash of balsamic vinegar and dried basil, thyme, or sage. Wrap a couple of russet or sweet potatoes in foil. Toss everything into the oven. An hour later- dinner is ready. Wash the potatoes; prick with a fork; wrap in foil. Place the potatoes in the hot oven, on the top rack, and bake for 15 minutes. In the meantime, combine the cut veggies and garlic in a roasting pan and toss with the olive oil, balsamic vinegar and sea salt; add your favorite seasoning. Add the pan of vegetables to the oven on a lower rack, and bake for 45 minutes, until the potatoes and the vegetables are tender. Stir at least once during roasting. To serve, place each potato on a serving plate, split open, and season with a drizzle of good tasting extra virgin olive oil, sea salt and pepper. Top each potato with the roasted veggies, and sprinkle with shredded Parmesan, vegan, feta or goat cheese. Serve with Hummus, Tahini, Jalapeño Lime Hummus, or a side of baked beans and tender baby greens. Layer split potatoes with my Vegan Pesto. Add pine nuts, sunflower seeds, or toasted pumpkin seeds for some crunch. Other veggies to include: mushrooms, onion, cauliflower, green beans, spinach leaves, Swiss chard, artichoke hearts, shredded cabbage, bok choy, etc. Add more protein by adding drained canned chick peas, or white or black beans during the last 15 minutes of roasting. Add protein with 2 chopped hard boiled eggs; sprinkle on the veggies. Sprinkle with slivered almonds, chopped pecans or walnuts. I hope you enjoy our Roasted Veggie Smothered Baked Potato recipe. Let me know what you think; and please if you have any great healthy recipes that you enjoy, feel free to send them along so we can share them. Untile next time, remember to Eat Well and Eat Healthy.